Attractive, natural-looking teeth help us look and feel our best. They let us enjoy the foods we love, and they allow us to be naturally confident. Missing teeth can and should be replaced. This is because each and every gap potentially poses problems to your long-term dental health. In fact, even one missing tooth can ultimately lead to the loss of additional teeth and, ultimately, a permanent change in your facial appearance. Your implant can last a lifetime with proper care and good oral hygiene. Dental implants have been accepted by dentists for over 40 years as a successful and trusted method of tooth replacement. They provide stability and comfort with no adjustment necessary after placement and little effect to your surrounding teeth. 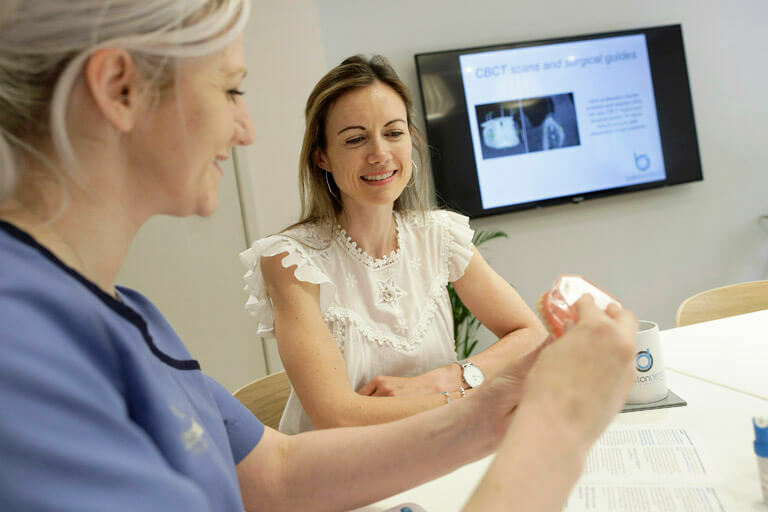 Our implant dentist will assess your suitability and advise on a suitable solution. You’ll have every opportunity to ask questions and we welcome this, to ensure you are completely comfortable with the procedure. Placing is performed quickly and is relatively pain free. A small hole is drilled into the jawbone and the implant is then fitted. A new artificial tooth will be fitted onto the implant 3-6 months after placement. We’ll check the implant to ensure it fits properly, is comfortable and matches your other teeth, and advise you on the best aftercare. It’s an artificial tooth root made of biocompatible materials. Placed beneath the gum line and into the jawbone, it creates a secure place for replacement teeth or bridges to be positioned. From consultation to brand new smile, dental implant treatment usually takes around 3-6 months. It can vary from one person to the next – we’ll discuss this during your consultation. At Beeston Dental Practice, we’re committed to making all of your visits as comfortable and pain and stress-free as possible. We use local anaesthetic when placing the implant into your gum and jaw to ensure no discomfort. We also offer sedation for our more nervous patients. You can ask any questions and expect honest, straightforward answers and we’ll go through each step of the treatment in detail.